Taste test: This bag looked like it was quite full, but when I opened it, the chips came less than halfway up the bag, with the rest being air. Most of the chips were brown around the edges. 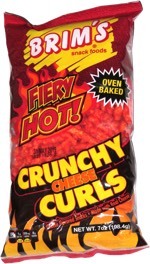 The chips were tasty, but they had just the slightest jalapeno flavor and little to no jalapeno heat. The kettle-cooked potato taste was quite good, though, and worked very well with the largely non-jalapeno spices. 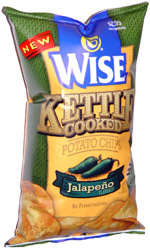 Of course, jalapeno chips are supposed to have lots of jalapeno flavor and heat, so overall it was quite disappointing. But the chips still tasted pretty good. Smell test: Very nice potatoey smell, maybe a little spicy even, but no jalapeno smell.